The land on which you will pitch your tent is a 3 hectare meadow planted with trees alongside a lake and a first grade brook. The campsite only provides basic facilities thus the accommodation is limited to 20 people. The campsite is located between the Larzac plateau and the Tarn valley, in the southern Aveyron, nearby the Roquefort caves. During your stay you will enjoy the sunny weather, and the calm, peacefulness of nature. You will receive a friendly welcome in private accommodation, and have the opportunity to rediscover a convivial atmosphere and enjoy the good life in the great outdoors. 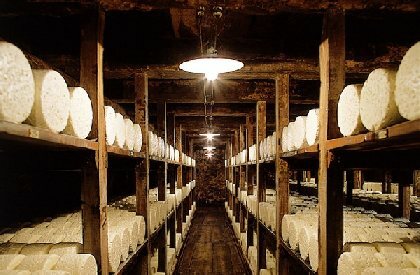 Visits to this famous cheese's maturing caves. Reconstruction of the formation of the caves. History of Roquefort. Commentated visit of the refining caves. Free tasting. 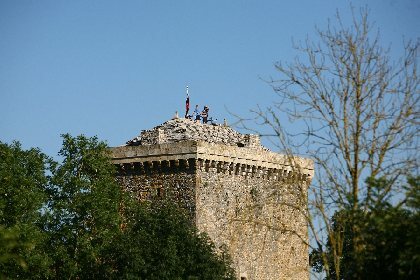 Situated on the Larzac 15 minutes from Roquefort, the Viala du Pas de Jaux Tower offers a discovery of its riches and its incomparable panorama from the top of the tower on the sentry walk-way. Built in the 10th century, cellar, rooms with vaulted ceilings accessed via a spiral staircase, guards room, great room, kitchen and bedrooms show daily life in the Middle Ages. You can borrow medieval costumes for your visit and make unforgettable moments. Games in english for children in the castle and around. Documents translated in english.